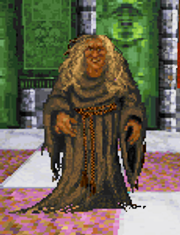 Nulfaga was mother of King Lysandus of Daggerfall. After her son was murdered in 3E 403, she disappeared from sight and retreated to her castle Shedungent in the Wrothgarian Mountains, rumored to have gone crazy. She was rescued and cured by the Hero of Daggerfall. Nulfaga is also reportedly a powerful witch. She found the exact location of the Mantella, the heart of Numidium, in 3E 401. She had a dragon familiar named Skakmat. Esta página foi modificada pela última vez à(s) 20h49min de 9 de fevereiro de 2014.